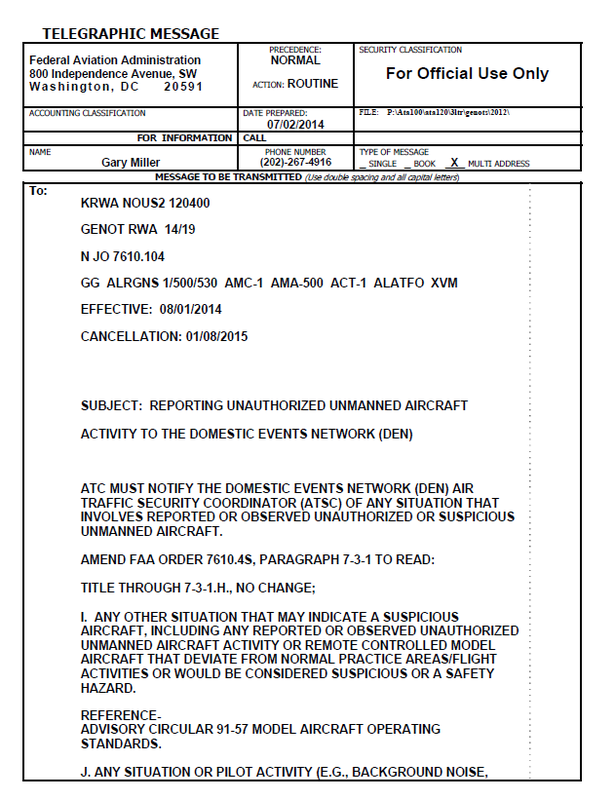 The following notice was publicly issued by the FAA on July 14, 2014. ATC MUST NOTIFY THE DOMESTIC EVENTS NETWORK (DEN) AIR TRAFFIC SECURITY COORDINATOR (ATSC) OF ANY SITUATION THAT INVOLVES REPORTED OR OBSERVED UNAUTHORIZED OR SUSPICIOUS UNMANNED AIRCRAFT. I. ANY OTHER SITUATION THAT MAY INDICATE A SUSPICIOUS AIRCRAFT, INCLUDING ANY REPORTED OR OBSERVED UNAUTHORIZED UNMANNED AIRCRAFT ACTIVITY OR REMOTE CONTROLLED MODEL AIRCRAFT THAT DEVIATE FROM NORMAL PRACTICE AREAS/FLIGHT ACTIVITIES OR WOULD BE CONSIDERED SUSPICIOUS OR A SAFETY HAZARD. ADVISORY CIRCULAR 91-57 MODEL AIRCRAFT OPERATING STANDARDS. J. ANY SITUATION OR PILOT ACTIVITY (E.G., BACKGROUND NOISE, CHANGE IN PILOT’S VOICE CHARACTERISTICS, ETC.) THAT MAY INDICATE A HIJACKED AIRCRAFT. DUE TO AIR TO GROUND COMMUNICATIONS CAPABILITIES (E.G., DATA LINKS, CELLULAR PHONES), CONTROLLERS MAY LEARN OF A HIJACK SITUATION FROM ALTERNATE SOURCES (E.G., AIRLINE AIR OPERATIONS CENTER) RATHER THAN THE AIRCREW ITSELF.